There are many attractions on and near the Kancamagus Highway. The Kanc itself is a beautiful natural attraction. 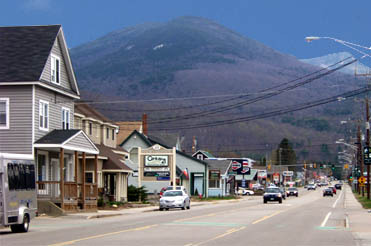 On both ends of the Kancamagus Scenic Byway there are many shops, hotels, cabins, condos, and other attractions. The Conway NH side has many small home type businesses as well, like wood carvings, copper cupolas and gift shops that are fun to stop in and shop around. A view of Rt. 112 in Lincoln, just West of the Kancamagus Scenic Byway. On the Lincoln NH side of the Kancamagus Highway, you will find Loon Mountain, which offers skiing in the Winter time and other activities year round. In front of Loon Mountain at the main entrance, there is a train with the original tracks used on the Kancamagus Highway during the years of logging which formed what is now know as the Kancamagus Highway. History of the Kancamagus.